The Legal Australia-Wide Survey (LAW Survey) provides the first comprehensive quantitative assessment across Australia of an extensive range of legal needs. With 20,716 respondents across Australia, including over 2,000 in each state and territory, the LAW Survey allows for in-depth analysis of legal need at both the state/territory and national level. It examines the nature of legal problems, the pathways to their resolution and the demographic groups that struggle with the weight of their legal problems. 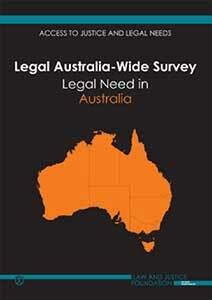 Commissioned by the eight State and Territory legal aid commissions, the LAW Survey is the largest of its kind ever conducted in the world. The survey is authored by Christine Coumarelos, Deborah Macourt, Julie People, Hugh M McDonald, Zhigang Wei, Reiny Iriana and Stephanie Ramsey of the Law and Justice Foundation.